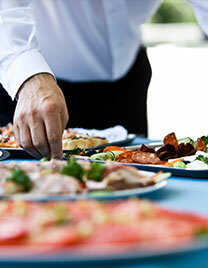 OIG employs a team of chefs that specialise in catering for any type or size of event. We have extensive experience in providing catering services for government, and corporate facilities, hospitals and camp catering for the industrial sector. We can also provide cafeteria facilities for our clients. Our kitchen management team and catering staff (who provide over 15,000 meals a day for our own staff), will travel anywhere within the Sultanate to ensure a fully catered service is provided. Our chefs can also take over the full management of our client’s kitchen facilities where required.